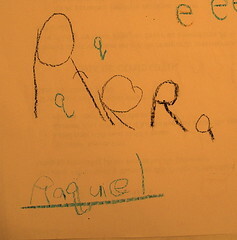 I know Raquel is smart but she still manages to impress me with new skills. Her teacher was the first one to introduce her to the concept of lowercase letters. 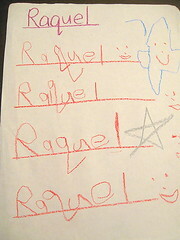 Raquel had only known capitals and only knew how to write her name in all caps. Teacher wanted us to practice with her at home so we have been doing that. She has improved so much in just a few days. The picture above and to the left is her first attempt. And a couple of days later she did this. I wrote her name up at the top so she could go by my example. I put a silver star next to the one she did the best. I have been getting a lot of compliments from teachers at the school on how I make Raquel's lunch. 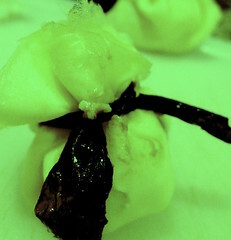 Last night I tried something new: a thin egg omelette wrapped around a small rice ball that I had dipped in light soy sauce. I tied it with nori. It was not easy to tie and didn't look as pretty as the picture in the recipe on Justbento.com but everyone asked me about it today--it surprised them that it really wasn't as fancy as it looks--it was basic foods, nothing Martha-Stewart-y. Raquel ate one but not the other so I'm not sure she liked it. 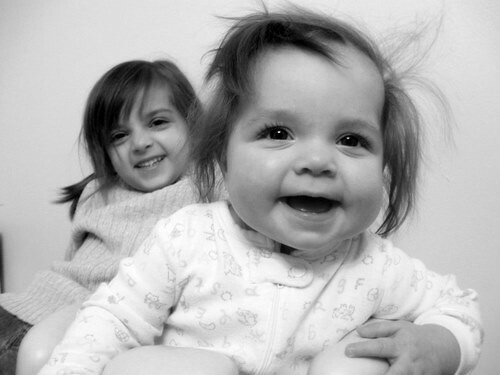 And here are some portraits I took of the girls over the weekend that I think will make you smile. That last one reminds me of chimps! Thanks for reading. pretty lunches--hopefully they taste good too- i guess so if raquels eatin them up! Raquel eats most of them up but it takes her FOREVER. I sit there in the cafeteria with her and the other kids are long gone. She gets so distracted. 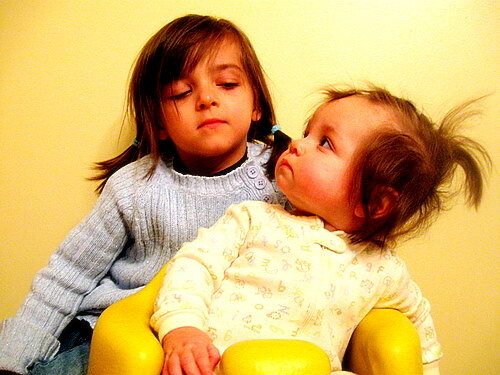 Oh they're so adorable! 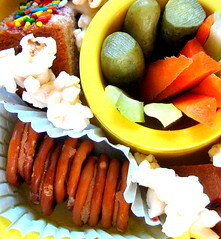 I really love the second photo :) And wow, I wish I had my lunchbox treats that pretty when I was a kid! Oh Sarah, you're a super cool mom for having these awesome lunches for the girls! Those pictures are amazing. You can't get poses like that at any professional photo place. 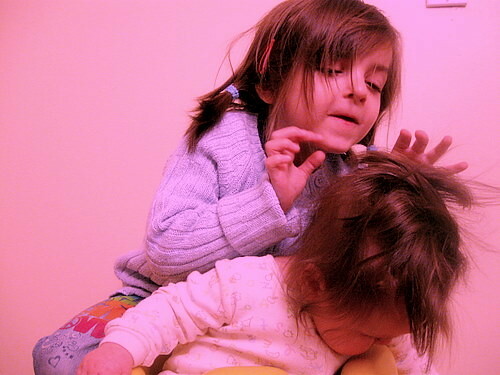 They are so natural and lovely! ovenhaven: the second one is my fave, too! Thanks. Iris: Thank you! The few times that I've gotten portraits from Sears, Penny's or Kmart I have not been satisfied. They're affordable but the results are not charming or impressive. Thank goodness for digital cameras!